As part of our Grand Opening, we are offering a 15% discount to our members by using keycode Open15. Remember to check back often as we will be adding new products and designs regularly, and also be sure to sign-up for our newsletter to receive notifications on exclusive member discounts. 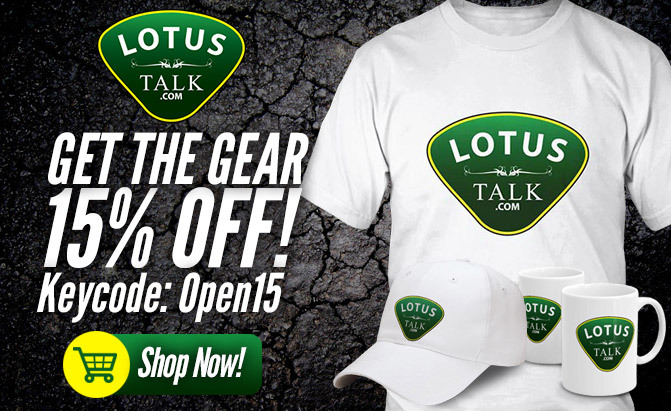 Get The Gear at http://store.lotustalk.com/! Such bad timing... Now this site wants our name, address, and credit card info. Hahahahahaha. The site store is run by a third party provider that we teamed up with. The information is not held on our database. Is the idea of your store to only offer LotusTalk branded items or do you plan to also offer Lotus (cars) branded items? BTW will it accept PayPal? I'll be honest and say that the reason I would buy something from the store is because of the alternate designs...which still feature your logo/brand...yet also have a cool design like the esprit or etc..
just the words Lotus, or Talk, or them combined doesn't mean a whole lot to the majority of people that haven't heard of your forum, are just enthusiasts V. owners, or are people who have never needed the services of a Lotus Forum.....BUT the iconic image OF A Lotus or something similar, is far more attractive, and would draw a lot less questions from the general public...Say if I wore a "Lotus Talk" hat...unless it was at a lotus meetup/rally/race/convention, I might get more questions or comments from botanists or yoga fans, than what you focus on...The best cars in the world...well, I mean the Best car, The Esprit..but also some other good ones too!